Looking on the bright side this is the chance to see all six Star Wars films on the big screen once again, but the competence of the 3D conversion will have to be decent to make this a worthwhile return. Certainly these 3D re-releases will become very big business over the next decade or so with James Cameron’s Titanic looking great in 3D when we saw a few scenes a few months ago, and so George Lucas’s saga returns to cinemas with a new dimension. This new poster isn’t exactly up there with the design classics of Drew Struzan but it does the decent thing and omit Jar-Jar Binks and Anakin Skywalker from proceedings – perhaps Lucas could have gone back to the Wacom tablet and erased them from the actual film. 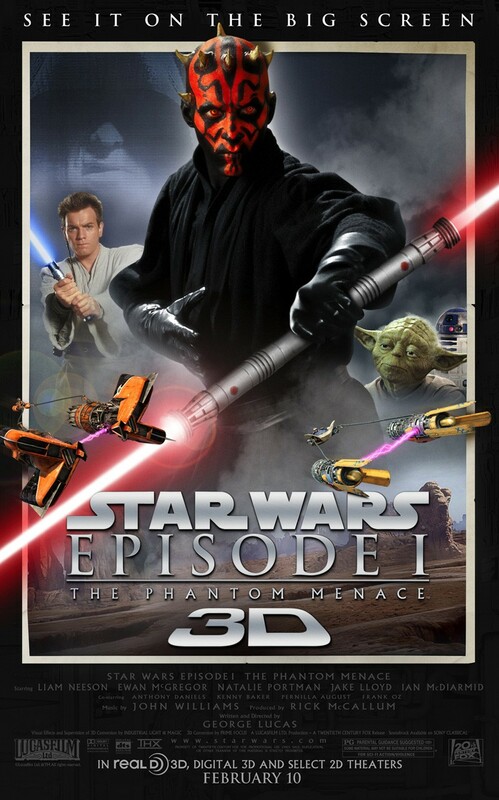 They did miss out on a new tagline though – ‘Pod race IN YOUR FACE’ or ‘Jar-Jar now has DEPTH!‘ but whatever you think of The Phantom Menace there is a nice phrase on the poster which bodes very well for the next few years – ‘and select 2D theatres’.